More later, but Sunday morning could bring some fun waves. Waist to chest high, and right now, Weather.com says SW winds turning SSW by noon on Sunday. I was browsing videos of the Unheard of Perfect and huge swell of Summer of 2012 Cloudbreak, Figi, and the footage of instead back door massive barrels blew my mind. Absolutely amazing footage! The 2013 Billabong XXL contest is on, and John John Florence has an entry for the Ride of the Year Entry, on massive wave at Cloudbreak, Fiji from June of 2012. Shawn Dollar from Santa Cruz, Ride of the Year entry for the 2013 Billabong XXL Awards, should definitely be the winner. Cortes Bank, looks not only the biggest wave, but his recovery 3 or 4 times on choppy 60 foot face wave, and the water is probably the coldest anywhere, being 100 miles off the coast of California, ouch! Friday, by nightime, the swell hits a long period 13 seconds in the 3 foot range, NE winds, maybe something in Satellite Beach with chest high plus drops. Saturday, the size jumps from 3.5 feet to 6 feet at 13 seconds, so Palm Beach , Reef Road should be cranking, and we believe the swell will hit Satellite Beach pretty well by this time at night, overhead chop, but late in the day. Monday thru Wednesday of the next week, will probably have big waves, but to far out to tell. Billabong XXL Big Wave Awards Nominees 2012 Video plus Lazy Update Wednesday afternoon at 3:30 PM , Thursday may have some leftovers, but the offshore winds are blowing west out at the 120, so I wouldn’t count on much Thursday morning. It shows a 1.5 foot ground swell which I have seen a swell that size produce chest high at Perkins, but in this case, I go with knee to waist high, North going South. Saturday some time the big wind swell starts pushing in, bring big chop waves for the Easter Surf Fest, yeawwwwwwwwwwwww!!!!!!!!!!!!!!! Sunday big overhead chop, Waves should be here thru Monday still overhead with reduced onshore winds for Monday, and maybe some Tuesday rib high glass. Be sure to check out the 48th Annual Easter Surf Fest at Shepard Park and the Ccocoa Beach Pier. Everything below is from Surf Report that I did on Tuesday April 3rd. This is spectacular video footage of Jaws, from one of the two big paddle in sessions, this one on January 4, 2012, this year. Wave size was 45 to 60 foot faces, approx. The music, the insane rides and drops, totally awesome, especially from Jeff Rowley, the newcomer to Peahi, who is from Australia. Jeff is nominated for the Billabong XXL Ride of the Year award. Surf Update; Tuesday night a maybe ground swell rolls in, and for Wednesday morning, possibly thigh to rib high waves and brisk offshore winds. Thursday morning leftovers probably, and then flat till Sunday for the most part. Sunday could be some overhead chop down south and maybe some chest high stuff at the Cape. The swell angle is NE, so we will get some blockage, how much, can’t say 🙂 We should have more big chop with winds backing off on Monday to under 15 mph possibly, but we’ll know more definite on Saturday night. Mary had a little lamb his fleece was white as snow and every where that Mary went the lamb was sure to go. He followed her to school one day, it was against the rules. He made the children laugh and play to see a lamb at school. And then the rules all changed one day, illegal it became; to bring…. the Lamb of God to school or even say his name. Everyday got worse and worse, and days turned into years. Instead of hearing children laugh we heard gun shots and tears. What must we do to stop the crime thats in our schools today? Let the Lamb come back to school and teach our kids to PRAY!!!! The swell starts rolling in Monday morning really steep from the NE. But by Tuesday, the angle turns from the East, on thru Thursday at least. We should see 4 to 6 foot faces depending on a North break or a South break. (obviously , the closer to Satellite Beach the bigger 🙂 Mostly medium East winds (probably 10 to 15 mph) until Thursday or Friday. Possible offshore day on Thursday or Friday. We’ll keep ya posted. This video is the best Surf Video I have seen; 1st the footage of the most epic day/swell to hit Fiji of 25 to 40 foot face waves with perfect glass, most everyone is paddling in, not all. 2nd, then the production quality by Tim Bonython Productions with editing by Corey Maynard, using Piano music by Tripswitch, LR-60 & Mr. Moods, and Echelon Effect, the piano magnifies and defines the epic perfection of the clear Blue Water of Cloudbreak , Tavarua, Fiji. Jeff Rowley is on a goal to raise $ 1,000,000 for breast cancer and he intends to do this by surfing massive surf all over the globe. I am sure there is a personal part to his life that has him totally passionate about achieving this goal, though I haven’t found out who affected him for this drive. I recently saw a new video of his first paddle in session at Maui/Jaws-Peahi for 40 to 50 foot face waves. Jeff was born with club feet and had to have surgery just after his birth. His mother was told that he may never be able to walk. But I guess he was very stubborn, because if you watch the way he carves 30 to 40 foot faces at Cloudbreak with no fear, he obviously adapted to his life born disability. Midway or more into the video, a Kite-Surfer performs incredibly on a 35 foot +/- face wave. Near the end of the video Jeff Rowley takes off on a massive wave at the same time Jason Polakow drops in with his Sailboard, and then they carve the face of this massive wave at the same time as if the act was practiced and performed many times before. Impeccably orchestrated, all of the footage. Then at the very end, Jeff solo, takes what looks to be the wave of the day 35 to 40 foot face and handles it like an 8 foot wave. Followed by Jason on a solo with his sailboard on a similar size wave going vertical with the sailboard down the face. I can’t use enough adjectives to describe the quality of the filming, the surfing, the massive glassy perfection, the choreography of the surfing and sailboard, the music and the goal of Jeff Rowley to raise money for breast cancer. In case y’all don’t get to keep up with the contests on the regular normal wave ASP tour, or keep up with the XXL Big Wave tour, this has been a record year for the world’s great big wave surf breaks. Teahupoo (of whom our local legend Kelly Slater won the ASP event), and the fact that he skipped the J-Bay event offering 6 foot waves in order to catch some 30 to 40 foot plus tow in surf at Fiji for the epic 50 year storm, 49 foot swell on the charts, that swept into the Tasman Sea. That storm hammered Australia, and brought the most incredible waves to Cloudbreak, Restaurants and Tavarua Fiji. Okay, the long wind ceases, surf in Brevard…………………. Today (Wednesday), a foot or so overhead in Satellite Beach and chest high plus at the Cape. (probably a few head high sets here at the Cape). The winds should be in the 10 to 15 mph NE direction, so right at dead high tide (around 2 PM), you can catch the easiest paddle out, the cleanest time of day for the faces, the best shoulders while it is high tide. Thursday, probably a foot bigger down South maybe some 2 foot overhead waves, and with a lot more power because the ground swell rolls in after midnight Wednesday night/Thursday morning. We ought to see some head high waves at the Cape, and the winds ought to be mild onshore, like 5 to 6 mph NE all day. So it could be real fun Thursday. Friday, still looks like the epic day! Head high to maybe a foot or so overhead in Satellite Beach and solid chest high plus at the Cape. The swell does drop off a bit late Friday but not much. If the wind models hold out, it looks to be 4 to 6 mph offshore winds out of the West to SW. Yowwwwwwww!!! Saturday, a new swell piggybacks the departing Friday swell with strong North to NNW winds, probably 15 to 25 mph. but it could be head high and semi-glass up North in the morning, and by dinner time, we may be seeing some 8 to 10 foot faces down South. Sunday morning ought to have some large sets come in with 8 foot faces at the Cape, and probably some 10 foot plus faces down South. But the winds (as a guess out of the 48 hour window), are looking to be NNW and over 20 mph, but it could be really sweet at the Pier and the Jetties. I don’t see any drop in swells for a week out, so eat well, bring a rash guard at least for Friday morning, because it may be around 62 to 64 degrees in the morning, not cold, but with the water temp lingering only about 2 degrees above spring water temps, it may be a little chilly. The next Friday Fest is scheduled for November 4th from 6:00 pm – 10:00 pm. Activities will include a variety of food vendors, an assortment of novelty & craft vendors, children’s activities including bounce houses, a giant slide & games, live entertainment along with beer & wine. Live entertainment will feature “Entasy” on Taylor Avenue & “Lonnie & Delinda” on Poinsetta Avenue. The fun will take place on Taylor Avenue & Poinsetta Avenue. I do need to add one more video link here. Andy Irons, one year has passed. I could quote some of what they say, but just check it out here. EPIC CLODBREAK JULY 2011 from IronFistMedia on Vimeo. Been swamped with stuff, yeah no excuse 🙂 But if you read my forecast in my very last post before this one, I threw down my call for Tuesday morning, 7/19. The wind swell we had, was providing us with potential NNW winds for Tuesday morning and it did for a few hours actually. I surfed behind Holiday Inn cause it had to be a North wind break (anything from 4rth St North to the pier for this swell cause the Cape itself was kinda blocked by this swell). It was stomach to chest high when I paddled out at 7 Am, only 2 guys out, and it was ripping lefts and rights. The lefts were instant barrels cause me, a normal foot had to do rail grabber takeoffs on every one, and you pretty much got coverage on some waves if you kept at it. The rights were fast takeoffs, but gave you more time, and for the long boarders 100 yard plus rides. By 7:45 some short boarders came out, and we all tore it up together, giving each other waves, and we shared a few tandems with every one coming out happy. By 8:30 it had some bigger sets, and I caught my only shoulder high wave, a right, shoulder high almost all the way in, and took it to the sand. Awesome session………………………………………. Okay, as far as surf headed our way. Really nothing. Like Ross at cflsurf.com says maybe some knee high action, I looked at Hightowers today mid-morning and it was actually thigh to maybe waist and was ridable but I didn’t have my board. 2 guys out way North on the break but it was onshore not much of a swell so I wasn’t too upset. Enjoy the video don’t forget to click the 4 little arrows right of the HD letters in the video for full screen view, and we’ll keep the watch for a swell. It’s almost cane time. Fijian Fire & Brimstone from MSW on Vimeo. Massive and perfect swell to hit Fiji, (watch it full screen by clicking on the 4 little white arrows) the one I mentioned the other day that hit 49 feet at 17 seconds on the MagicSeaweed.com surf report. This one minute video shows a few awesome waves both face size and barrel, but first our local Swell coming in for Sunday, July 17th at our own East Coast of Brevard County, Florida. Yeah, another swell rolling in from the NE ? what ? , in the summer, yup! Okay, it is a wind swell as opposed to a ground swell, its only 3 to 4 foot wind swell but it could be fun and clean (light onshore winds Sunday morning and up till noonish), and Monday morning could be stomach to chest high and glassy based on data I have now . Don’t expect long lines cause it is a wind swell, and all this could be totally different data by Saturday, but……….it is summer so God is good to us. Monday could be stomach to chest high and glassy, so when Saturday night rolls around I will have more reliable wind direction data, which is always gonna be sketchy, but at least 50 % reliable anyhow 🙂 By the way, Saturday could have something hitting the beaches for us also, but I’m only excited about Sunday and Monday. Recap, Sunday morning and day, waist to chest high and semi-clean 5 to 8 mph East to ENE winds. Monday, waist to chest high and light offshore winds until maybe mid-morning. Saturday night I will have more reliable wind data for Monday morning. Plus, Saturday night I will give you wind data for Sunday morning. 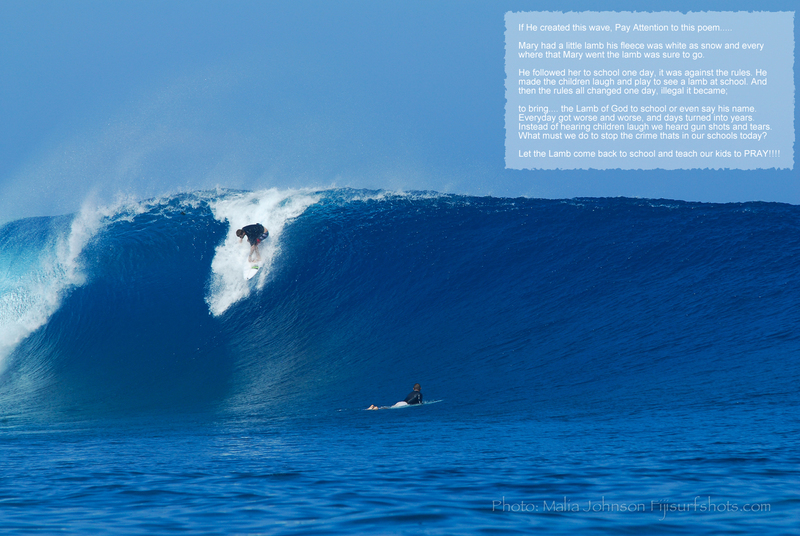 The Video above is from Cloudbreak, Fiji. Kelly Slater skipped the ASP tour event at J-Bay to make this massive and perfect swell that hit Fiji. Kelly in the picture below the video from Magicseaweed.com. We’ll keep ya posted the next few days to see how the wind swell pans out. Okay, now we’re caught up on the Billabong XXL Big Wave videos. Check out the new entrant. The boys from Ireland have a lot to show for the emerging monsters. Between some of the breaks around LaHinch Beach around the NNW point of Ireland, they have had some mega 40 to 50 foot face waves in the last 12 to 18 months of La Nina surf season. Also, check out Shipstern Bluff. I have asked myself, why do those guys surf there, since the moment they hit that part of the wave were it seems like a big chasm or black hole in the ocean floor appears, and thus they have the most incredible wipeouts cause they’re not expecting a sudden free fall at the peak of the barrel of the wave. Then it dawned on me; that’s why they like it, it’s like having a cinderblock laying at the bottom of a skatepark bowl, forcing them to “think on their feet” if you will. So watch the different way these crazies choose to respond to the “black hole” part of the wave at Shipstern Bluff, Tasmania. 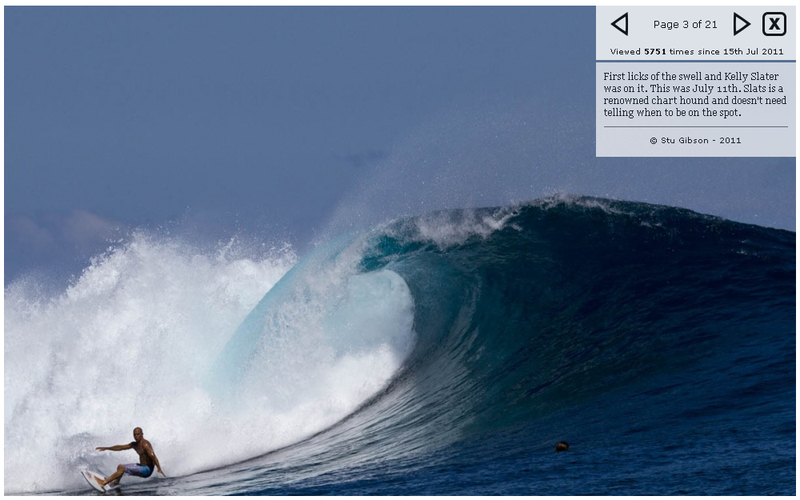 Also, “Cloudbreak” in Fiji, is a new entrant. Another 40 foot face entry, and especially the paddle in wipeout in what looks like a 40 foot plus face. I bet that one wins the wipeout of the year award. Anyone that has the balls to keep on paddling for that one, then goes one step crazy further by grabbing the rail of the board in order to make the straight/angled drop, they have my vote for the best and most ballzy calculated attempt and then wipeout ! Last, Chile had a massive year, that 45 – 50 foot face in their freezing cold water gains the same respect as freezing Mavericks, Prowlers and Oregon’s last 50 – 60 foot wave video shown on Seaweed not long ago. Enjoy, and I hope ya don’t mind me posting these things. I love watching huge waves. Now that the rumor is out that Kelly Slater may start participating in some of this kind of surfing, I’m even more fired up. Anyone that can terrorize the competition in the ASP regular surf tour, and then turn around the next week and paddle into a 30 – 40 foot face at the “Eddie”, is certainly one ballsy individual.